Author contributions: Melnik BC solely contributed to this paper. Epidemiological evidence points to increased dairy and meat consumption, staples of the Western diet, as major risk factors for the development of type 2 diabetes (T2D). This paper presents a new concept and comprehensive review of leucine-mediated cell signaling explaining the pathogenesis of T2D and obesity by leucine-induced over-stimulation of mammalian target of rapamycin complex 1 (mTORC1). mTORC1, a pivotal nutrient-sensitive kinase, promotes growth and cell proliferation in response to glucose, energy, growth factors and amino acids. Dairy proteins and meat stimulate insulin/insulin-like growth factor 1 signaling and provide high amounts of leucine, a primary and independent stimulator for mTORC1 activation. The downstream target of mTORC1, the kinase S6K1, induces insulin resistance by phosphorylation of insulin receptor substrate-1, thereby increasing the metabolic burden of β-cells. Moreover, leucine-mediated mTORC1-S6K1-signaling plays an important role in adipogenesis, thus increasing the risk of obesity-mediated insulin resistance. High consumption of leucine-rich proteins explains exaggerated mTORC1-dependent insulin secretion, increased β-cell growth and β-cell proliferation promoting an early onset of replicative β-cell senescence with subsequent β-cell apoptosis. Disturbances of β-cell mass regulation with increased β-cell proliferation and apoptosis as well as insulin resistance are hallmarks of T2D, which are all associated with hyperactivation of mTORC1. In contrast, the anti-diabetic drug metformin antagonizes leucine-mediated mTORC1 signaling. Plant-derived polyphenols and flavonoids are identified as natural inhibitors of mTORC1 and exert anti-diabetic and anti-obesity effects. Furthermore, bariatric surgery in obesity reduces increased plasma levels of leucine and other branched-chain amino acids. Attenuation of leucine-mediated mTORC1 signaling by defining appropriate upper limits of the daily intake of leucine-rich animal and dairy proteins may offer a great chance for the prevention of T2D and obesity, as well as other epidemic diseases of civilization with increased mTORC1 signaling, especially cancer and neurodegenerative diseases, which are frequently associated with T2D. The prevalence of diabetes mellitus is increasing worldwide and the number is expected to reach 366 million by 2030. Ninety percent of patients with diabetes have type 2 diabetes (T2D). T2D and obesity are major features of the metabolic syndrome, which significantly increases the risk of coronary heart disease, cancer and neurodegenerative diseases. More than 11% of US adults aged ≥ 20 years have diabetes. Although obesity and sedentary lifestyle account for much of the increase in the prevalence of T2D, dietary factors play an important role in the development of T2D[3,4]. The protein-enriched “Western diet” has especially been associated with an increased risk of T2D, confirmed by several cohort studies[5-18]. During the last decades, the most attention has been paid to the role of high fat and high glycemic load as dietary risk factors in the development of T2D. Although several studies[5,6,9,11-16,19] already pointed to an association between higher meat intake and increased risk of T2D, the functional effects of dietary proteins in the regulation of β-cell homeostasis has not received appropriate medical attention. Most Americans consume protein in excess of their needs. Protein intake averaged 56 ± 14 g/d in young children, increased to a high of approximately 91 ± 22 g/d in adults aged 19-30 years, and decreased to approximately 66 ± 17 g/d in the elderly. The nutrition transition in Asian countries to Westernized dietary patterns has been associated with an increased prevalence of Western diseases, including T2D. In 1998, it was reported that secular trends in Japan exhibit a positive correlation between the intake of animal protein and animal fat and the rate of T2D among Japanese school children. A higher animal protein intake also occurred in China and was associated with economic progress. The total daily intake of animal proteins (g/d) of adult Chinese residents from 1998 to 2004 increased from 101 g/d to 161 g/d, respectively. The relative increases of individual animal meat intake rose from 1998 to 2004 for pork by 19.2%, for all processed meats by 200%, eggs and egg products by 136%, fish by 25% and milk and milk products by 500%, respectively. The Hong Kong Dietary Survey investigated the relationship between dietary intake and the development of T2D in China and recently confirmed that a dietary pattern containing “more vegetables, fruits and fish” was associated with a 14% lower risk of T2D, whereas the consumption of “more meat and milk products” was associated with a 39% greater risk of T2D. The evaluation of 3 cohorts of United States adults (Health Professional Follow-Up Study, Nurses’ Health Study I and II) suggested that red meat consumption is associated with an increased risk of T2D. There is a worldwide increase in animal and dairy protein consumption, exemplified by the yearly increase of meat and cheese consumption per capita in the Federal Republic of Germany from 1950 after World War II to 2008 (Table 1). The per capita total meat consumption per year increased from 26.3 kg in 1950 to 60.5 kg in 2010, respectively (Figure 1). Furthermore, the total cheese per capita intake increased from 1950 to 2010 from 3.9 kg to 22.8 kg, respectively (Figure 2). Meat and dairy proteins (whey protein and casein) are rich sources of leucine (Table 2). The high leucine content of meat and dairy proteins provided by the typical Western diet significantly differs from the low leucine intake of vegetable- and fruit-based traditional Asian diets (Table 3). 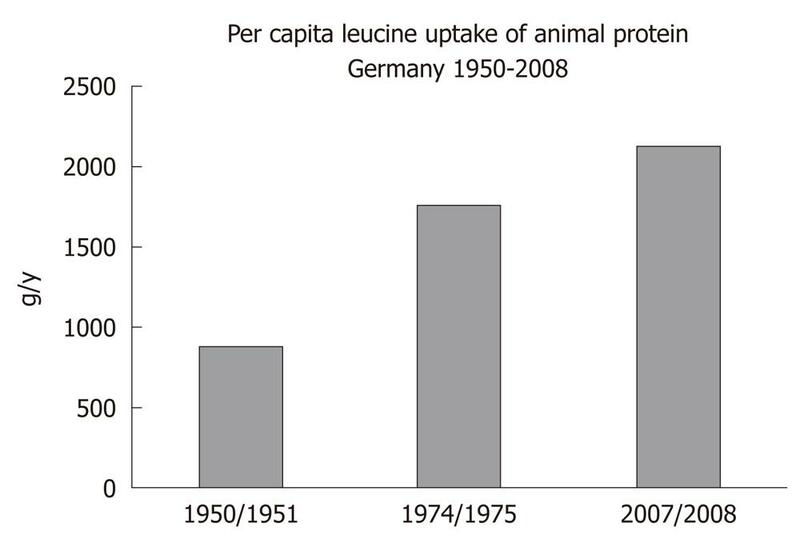 Thus, during the last 5 decades there has been a steady increase in leucine intake, exemplified by total annual per capita leucine consumption of the German population (Table 4, Figure 3). Table 1 Average animal product consumption (kg) per capita/y in Germany. 1Fish filet weight approximated with 48% of given catch weight; Data source: Statistics of Ministry for Nutrition, Agriculture and Consumer Protection, Federal Republic of Germany. 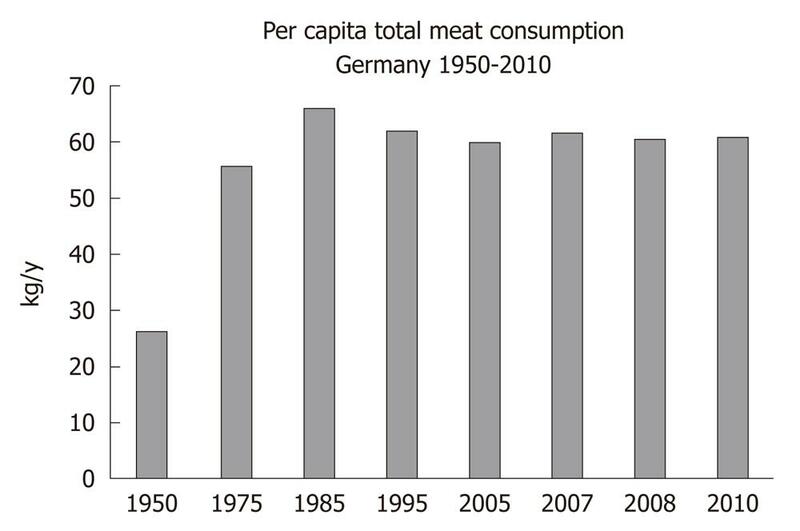 Figure 1 Annual per capita total meat consumption (kg) in Germany from 1950 to 2010. Table 2 Leucine-enriched animal-derived foods. Source: German Nutrient Database, BLS-version 3.01. 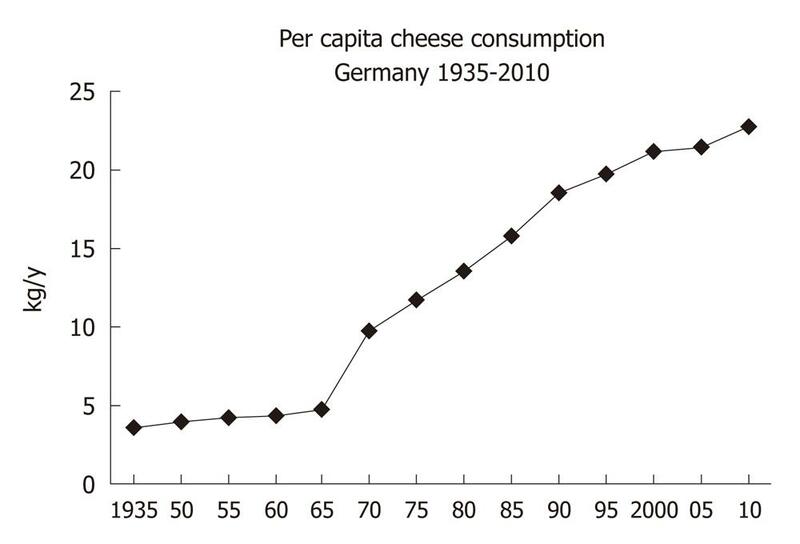 Figure 2 Annual per capita cheese consumption (kg) in Germany from 1935 to 2010. Table 3 Plant-derived foods with low leucine content. Table 4 Animal protein-derived leucine per capita intake (g/y) in Germany. Leucine, isoleucine and valine are essential branched-chain amino acids (BCAAs) important for the regulation of growth, protein biosynthesis and metabolism. Signaling through the nutrient-sensitive kinase mammalian target of rapamycin complex 1 (mTORC1) is activated by amino acids, with the BCAA leucine playing a major role[23,24]. Since mTORC1 signaling positively regulates protein synthesis and ribosome biogenesis, both of which require amino acids, it makes physiological sense that mTORC1 signaling is regulated by amino acid availability. Withdrawal of leucine has been shown to be nearly as effective in down-regulation of mTORC1 signaling as withdrawal of all amino acids. Moreover, the preeminent effect of leucine withdrawal has been consistently observed in a variety of cell types, thus underlining the primacy of leucine in amino acid-mediated mTORC1 regulation. Intriguingly, rat plasma levels of leucine were linearly related to the intake of gram protein diet regardless of the dietary source. In humans, highest postprandial leucine concentrations have been measured after a whey protein meal, followed by a milk meal and a cheese meal, respectively. The strongest correlation between postprandial insulin responses and early increments in plasma amino acids was demonstrated for leucine, valine, lysine and isoleucine. In comparison to other amino acids, leucine exhibited the highest insulinogenic index. These observations emphasize the crucial role of leucine in mTORC1 regulation, β-cell growth, β-cell proliferation and insulin secretion. Recent discoveries in the field of molecular biology have established the key role of the nutrient-sensitive kinase mTORC1 in the regulation of multiple central cell functions, including gene transcription, translation, ribosome biogenesis, protein synthesis, cell growth, cell proliferation, lipid synthesis and suppression of autophagy[28-33]. mTORC1 has been identified as the convergence point of nutrient-derived signaling (Figure 4). mTOR is a multi-domain protein of approximately 300 kDa exhibiting a protein kinase domain at its C-terminus related to phosphoinositol-3-kinases (PI3K). In mammalian cells, two functionally different mTOR complexes exist: mTORC1 and mTORC2, respectively. Among other functional proteins, mTORC1 contains the important partner protein Raptor, which interacts with substrates for mTORC1-mediated phosphorylation. mTORC1 controls the G1/S transition and G2/M progression of the cell cycle. In contrast to mTORC2, which contains the partner protein Rictor, only mTORC1 plays a special role in sensing cellular nutrients, amino acid- and energy (ATP) levels important for cell growth and proliferation. Liver kinase B1 and AMP-activated protein kinase (AMPK) are critical regulators of mTORC1. Most functions of mTORC1 are inhibited by rapamycin, a triene macrolide antibiotic synthesized by Streptomyces hygroscopicus[28,33]. mTORC1 has to be regarded as a key node in cell signaling because it integrates many intra- and extracellular signals, such as growth factors [insulin, insulin-like growth factor 1 (IGF-1)], energy-sensing signals (glucose, the AMP/ATP-ratio regulating AMPK) and, most importantly, the availability of amino acids, especially leucine for mTORC1 activation (Figure 4). Figure 4 Nutrient-mediated over-stimulation of mTORC1 by leucine-enriched Western diet. Leucine, insulin/insulin-like growth factor 1 (IGF-1) and glucose activate mammalian target of rapamycin complex 1 (mTORC1). Activated mTORC1 stimulates β-cell proliferation, increases insulin secretion and p70 S6 kinase 1 (S6K1)-mediated insulin resistance leading to early replicative β-cell senescence and apoptosis thus promoting the development of type 2 diabetes. AAT: Amino acid transporter; IR: Insulin receptor; GLUT: Glucose transporter protein; IRS-1: Insulin receptor substrate 1; PI3K: Phosphoinositol-3 kinase; Akt: Akt kinase [= protein kinase B (PKB)]; TSC1: Tuberous sclerosis complex 1 (hamartin); TSC2: Tuberous sclerosis complex 2 (tuberin); AMPK: Adenosine monophosphate-activated protein kinase; EGCG: Epigallocatechin gallate; DIM: 3,3’-diindolylmethane; SREBP: Sterol regulatory element-binding transcription factor. Recent advances in cell biology have elucidated two parallel mechanisms of mTORC1 activation: (1) the upstream activation of the small GTPase Rheb (Ras homolog enriched in brain) by growth factor signals and high glucose levels; and (2) the amino acid-mediated Rag GTPase-dependent translocation of inactive mTORC1 to active Rheb localized at late endosome or lysosome compartments[35-38] (Figure 4). Moreover, it has been shown that mTORC1 activity is regulated by Rab and Arf family small GTPases, which stimulate mTORC1 activation by regulation of intracellular trafficking, particularly in response to amino acids. Most recently, Raptor has been identified as an interacting partner of the signaling adaptor p62, which is an integral part of the mTORC1 complex and is necessary to mediate amino acid signaling for the activation of S6K1 and 4E-BP1. p62 interacts in an amino acid-dependent manner with mTORC1 and Raptor and binds the Rag proteins and favors formation of the active Rag heterodimer that is further stabilized by Raptor. Interestingly, p62 co-localizes with Rags at the lysosomal compartment and is required for the interaction of mTORC1 with Rag GTPases in vivo and for translocation of the mTORC1 complex to the lysosome, a crucial step for mTORC1 activation[23,40]. The activity of Rheb is tightly regulated by the tuberous sclerosis proteins TSC1 (hamartin) and TSC2 (tuberin), which form a functional heterodimeric complex. Intriguingly, loss-of-function mutations of either the TSC1 or TSC2 gene cause the hamartoma syndrome tuberous sclerosis. TSC1 stabilizes TSC2 that possesses a GTPase-activating protein, which hydrolyses GTP to GDP. The TSC1/TSC2 complex provides this function to Rheb, leading to inactivation of Rheb. Insulin and IGF-1 both activate the kinase Akt (protein kinase B) as well as other growth-related kinases such as ERK and RSK phosphorylate TSC2, thereby inhibiting the function of the TSC1/TSC2 complex. This inhibition leads to activation of Rheb and finally activation of mTORC1[41-43] (Figure 4). Besides the important input of growth factor signaling on mTORC1 activation, AMPK, an essential energy sensor, plays a key role in energy-dependent mTORC1 regulation. During states of energy-deficient conditions like glucose deprivation, ATP levels fall and cAMP levels rise, resulting in AMPK activation. AMPK phosphorylates TSC2 and Raptor, thereby suppressing mTORC1 activity[34,44,45]. Moreover, the AMPK activator cAMP inhibits mTORC1 and mTORC2 activity. Remarkably, cAMP inhibits insulin and amino acid-stimulated mTORC1 activation independently of Rheb, Rag GTPases, TSC2, Akt, MAPK and AMPK, indicating that cAMP may act independently of known regulatory inputs into mTORC1. Abundant cellular energy with low cAMP levels induced by the hypercaloric Western diet with high glycemic load thus reduces AMPK activity and cAMP levels and thus stimulates mTORC1 signaling. There is convincing evidence that other important nutrient and growth factor-sensors, especially the FoxO transcription factors, modulate mTORC1 signaling. Increased insulin/IGF-1 signaling and activation of the PI3K/Akt-pathway results in Akt-mediated nuclear phosphorylation of FoxO proteins, thereby promoting their extrusion from the nucleus into the cytoplasm. This FoxO shuttling mechanism functions as a molecular switch for FoxO-mediated gene regulation. Like mTORC1, FoxOs are involved in the regulation of cell metabolism, proliferation, apoptosis, anti-oxidative stress responses and autophagy. Intriguingly, FoxOs have emerged as important rheostats that coordinate the activity of Akt and mTORC1. Activated FoxOs (FoxO1, FoxO3, FoxO4) induce the expression of Sestrin3, which activates AMPK to inhibit mTORC1 in a TSC2-dependent manner. Furthermore, AMPK has been shown to phosphorylate FoxO3 and facilitate its nuclear localization. It has been demonstrated that Akt-phosphorylated cytoplasmic FoxO1 is able to associate with the C terminus of TSC2, thereby dissociating the TSC1/TSC2 complex, leading to activation of mTORC1. In response to amino acid depletion, mTORC1 activity is rapidly abolished. Amino acid starvation impairs binding of mTORC1 to Rheb[52,53]. From all essential amino acids, leucine exerts the greatest effects on mTORC1 signaling[24,30,33]. Recent evidence has been provided that amino acids and especially leucine promote the cellular translocation of inactive mTORC1 to lysosomal compartments enriched in activated Rheb[35-37]. This spatial regulation of inactive mTORC1 by amino acids is mediated by an active Rag heterodimer and is of utmost biological importance as it explains the complete mechanism of nutrient sensing of mTORC1. Thus, mTORC1 integrates not only growth factor/energy-derived signals to Rheb, but requires a parallel leucine-dependent signaling pathway for final mTORC1 activation by translocation of inactive mTORC1 to cell compartments enriched in activated Rheb (Figure 4). These two independent major pathways of mTORC1 activation explain why either insulin/IGF-1 signaling or amino acid signaling alone is not sufficient to reach maximal mTORC1 activation. Insulin is not able to activate the mTORC1 pathway when cells are deprived of amino acids. In fact, recent experimental evidence confirmed that both insulin and amino acid signaling are required for maximal mTORC1 activity in rat liver. Insulin resistance and obesity, as well as obesity-related insulin resistance, are major factors promoting the development of T2D. Insulin resistance of muscle cells, adipose tissue and liver results in raised circulating glucose levels increasing the metabolic and secretory burden of β-cells, which have to respond by increased insulin synthesis and secretion[55,56]. It is known that glucose robustly activates mTORC1 in an amino acid-dependent manner in rodent and human islets. In pancreatic β-cells, leucine acutely stimulates insulin secretion by serving as both metabolic fuel and allosteric activator of glutamate dehydrogenase (GDH) to enhance glutaminolysis. Moreover, leucine has been shown to regulate gene transcription and protein synthesis in pancreatic β-cells via mTORC1-dependent and -independent pathways. Activated mTORC1 phosphorylates important substrates involved in the regulation of the translational machinery, the p70 S6 kinases (S6Ks), which phosphorylate ribosomal protein S6, and eukaryotic initiation factor (eIF) 4E-binding proteins (4E-BPs), which control the activity of the translation factor eIF4E that binds to the 5’-cap structure of eukaryotic mRNAs, thereby facilitating ribosome recruitment[25,28]. Phosphorylation of insulin receptor substrate (IRS)-proteins on serine residues has emerged as a key step to control insulin signaling. Among the growing list of IRS kinases implicated in the development of insulin resistance, the mTORC1-activated downstream kinase S6K1 plays a major role[59,60]. S6K1-induced phosphorylation of IRS-1 mediates an important feed back mechanism, which downregulates insulin/IGF-1 signaling and is the molecular basis for insulin resistance, a characteristic feature of obesity and T2D[56,57]. mTORC1 and its downstream target S6K1 are thus critical regulators in mediating the nutrient effects on insulin resistance[61,62] (Figure 4). S6K1 negatively modulates insulin signaling by phosphorylating Ser-307 of IRS-1. Remarkably, absence of S6K1 protected S6K1-/- mice against age- and high fat-diet induced obesity while enhancing insulin sensitivity, pointing to the crucial role of the mTORC1-S6K1 pathway in the regulation of insulin signaling and induction of nutrient-induced insulin resistance due to hyper-activated mTORC1/S6K1. Recently, another S6K1 IRS-1 phosphorylation site, Ser-1101, has been identified in nutrient and obesity-induced insulin resistance. Insulin and IGF-1-stimulated PI3K/Akt-mediated nuclear extrusion of FoxO1 has also been shown to increase insulin resistance. Cytoplasmic FoxO1 binds to TSC2, thereby dissociating the TSC1/TSC2 complex, resulting in Rheb-mediated mTORC1-S6K1 activation. It has recently been shown in women with gestational diabetes that chronically increased S6K1 in skeletal muscle is associated with impaired glucose tolerance postpartum. The serine residues implicated in the negative feed back regulation of S6K1 are located at the PTB domain in close proximity to Tyr-phosphorylated consensus motifs at the C-terminus of IRS-1. Such phosphorylations result in dissociation of insulin receptor/IRS-1 complexes concomitant with an inhibition of downstream effectors to dock and bind IRS-1, thereby downregulating insulin signaling. Intriguingly, it has been shown in humans that insulin resistance was induced by infusion of high concentrations of amino acids, whereas the mTORC1 inhibitor rapamycin improved insulin action. Infusion of an amino acid mixture to healthy men resulted in plasma amino acid elevation, hyperinsulinemia and marked activation of S6K1 with increased inhibitory IRS-1 phosphorylation at Ser-312 and Ser-636/639. Amino acid infusion (containing 8.9 g/L leucine) impaired insulin-mediated suppression of glucose production and insulin-stimulated glucose disposal in skeletal muscle. Incubation of rat skeletal muscle with higher concentrations of both leucine and glucose caused insulin resistance, which was associated with a decrease in AMPK activity. Amino acid-mediated mTORC1- and S6K1-activation plays a crucial role in the negative regulation of IRS-1 phosphorylation, resulting in amino acid-induced insulin resistance. In accordance with these findings are feeding studies of rats with a high fat diet supplemented with BCAAs exhibiting chronic mTOR-mediated phosphorylation of IRS-1 at Ser-307, which was reversed by rapamycin treatment. Moreover, the dietary pattern that includes high fat consumption accompanied with high amounts of BCAAs appears to contribute to obesity-associated insulin resistance. Most patients with T2D are obese and the global epidemic of obesity largely explains the dramatic increase in the incidence of T2D over the past 20 years. Obesity-mediated insulin resistance is a major risk factor for the development of T2D. Individuals with visceral obesity release increased levels of tumor necrosis factor α (TNFα) into their systemic circulation produced by adipose-tissue resident macrophages. The TNFα/IKKβ pathway plays a pivotal role in TNFα-induced insulin resistance[17,73-75]. In addition to S6K1, Ser-307 has been implicated as the potential IKKβ phosphorylation site of IRS-1[75,76]. Intriguingly, IKKβ physically interacts with and phosphorylates TSC1, thereby suppressing TSC1, which results in mTORC1 activation. TNFα/IKKβ/TSC1/Rheb-mediated activation of mTORC1 is thus a most conceivable mechanism for obesity-mediated TNFα-mTORC1 activation and signaling to pancreatic β-cells amplifying mTORC1-S6K1-mediated and IKKβ-mediated insulin resistance by phosphorylation of IRS-1 Ser 307. Visceral obesity thus augments β-cell mTORC1 signaling, insulin secretion and contributes to insulin resistance. Adipose tissue like muscle is a major extrahepatic site of leucine metabolism. Notably, leucine is a significant precursor of fatty acid and cholesterol biosynthesis. Furthermore, in adipocytes, leucine has been shown to be the main regulatory amino acid activating mTORC1, S6K1 and 4E-BP1[79,80]. mTORC1 plays important roles in adipocyte regulation, including hypertrophic growth, leptin secretion, protein synthesis and adipose tissue morphogenesis[80,81]. The mTORC1 antagonist rapamycin has been shown to block adipocyte differentiation. Rapamycin specifically disrupted the positive transcriptional feedback loop between CCAAT/enhancer-binding protein-α and peroxisome proliferator-activated receptor-γ (PPARγ), two key transcription factors in adipogenesis, by directly targeting the transactivation of PPARγ. Remarkably, PPARγ activity was dependent on amino acid sufficiency, again linking amino acid status to adipogenesis. In isolated adipocytes, amino acids, and primarily leucine, stimulated phosphorylation of 4E-BP1 and S6K and induced multicellular clustering in adipocytes[84,85]. Intriguingly, it has recently been shown in S6K1-/- mice that lack of S6K1 impaired the generation of de novo adipocytes when these mice were challenged with a high fat diet, consistent with a reduction in early adipocyte progenitors. Thus, leucine plays a fundamental functional and structural role in adipogenesis and serves as a pivotal amino acid-stimulator of the mTORC1-S6K1 pathway, which drives the S6K1-dependent commitment of embryonic stem cells to early adipocyte progenitors, stimulates adipocyte differentiation via crosstalk with PPARγ and serves as a substrate for adipocyte lipid synthesis[80-86]. The importance of mTORC1-S6K1 signaling in adipogenesis becomes apparent in S6K1-deficient mice, which are protected against age- and diet-induced obesity while enhancing insulin sensitivity. It has recently been demonstrated that mTORC1 promotes the function of SREBP (sterol regulatory element binding transcription factor), a master regulator of lipo- and sterologenic gene transcription. mTORC1 regulates SREBP by controlling the nuclear entry of lipin 1, a phosphatidic acid phosphatase. Dephosphorylated, nuclear, catalytically active lipin 1 promotes nuclear remodeling and mediates the effects of mTORC1 on SREBP target gene, SREBP promoter activity and nuclear SREBP protein abundance. Hepatic triglycerides and SREBP-1 mRNA concentrations increased significantly in rats fed a 30% casein diet for 1 mo in comparison to a diet containing 30% soy protein or black bean protein. Elevations in BCAAs in human obesity were first reported in 1969. Recently, elevated BCAAs have been recognized as a “metabolic signature” predicting insulin resistance in human subjects. Measurements of leucine flux in rat tissues showed that adipose tissue is second only to skeletal muscle in its capacity to catabolize BCAAs and the capacities of skeletal muscle and adipose tissue are 6-7-fold larger than liver. In obesity, adipose tissue exhibits downregulation in BCAA uptake and metabolism, resulting in elevated levels of circulating BCAAs[90,91]. In obesity and states of insulin resistance, elevated BCAA levels have been associated with reduced expression of two adipose tissue BCAA catalytic enzymes: mitochondrial branched-chain aminotransferase 2 (BCAT2) and branched-chain α-keto acid dehydrogenase (BCKD E1α subunit) complex[90,92,93]. Obesity is related to increased synthesis of glucocorticoids. It is now apparent that tissue-specific changes in cortisol metabolism are of greater importance than altered blood cortisol levels in obese subjects. Inactive cortisone from the blood is converted to active cortisol by the enzyme 11β-hydroxysteroid dehydrogenase type 1 within obese adipose tissue. Thus, local adipose-tissue specific elevations of cortisol exist in obese subjects. Recently, BCAT2 has been recognized as an important player in the molecular crosstalk between glucocorticoids and mTORC1 signaling. In skeletal muscle, the transcription factor Krüppel-like factor-15 (KLF15) has been identified as a direct target gene of glucocorticoid receptor signaling promoting muscle atrophy. KLF15 up-regulates gene expression of BCAT2. Thus, the glucocorticoid-driven KLF15-BCAT2 axis in obese adipose tissue may function as a negative feedback mechanism to decrease further adipocyte BCAA uptake, thus attenuating leucine-mediated mTORC1 signaling. Roux-en-Y gastric bypass (RYGB) surgery has become an accepted treatment for excessive obesity. RYGB surgery is associated with weight loss, improved insulin sensitivity and glucose homeostasis, and a reduction in co-morbidities such as T2D and coronary heart disease. Metabolite profiling studies before and after RYGB surgery demonstrated that the BCAAs decreased following weight loss after the surgical procedure[90,98]. Moreover, RYGB in obese individuals significantly improved insulin sensitivity[98-100]. Elevated leucine levels in obesity with increased insulin resistance in contrast to reduced leucine levels after RYGB with improved insulin sensitivity may thus reflect crucial functional changes of either increased or mitigated leucine-driven mTORC1-S6K1-signaling. Degeneration of pancreatic islet β-cells is increasingly ranked as a key disease mechanism in T2D. Pancreatic β-cell mass regulation is a matter of proliferation and apoptosis. Over a lifetime, in T2D patients, β-cells exhibit both an increased rate of proliferation and apoptosis when compared with non-diabetic subjects[101,102]. mTORC1 plays a central role in β-cell proliferation and insulin secretion. Leucine activates mTORC1 independent of insulin by a process formerly designated as nutrient signaling[57,103]. The pancreatic β-cells express a variety of growth factor receptors like insulin receptor, IGF-1 receptor and glucose-dependent insulinotropic polypeptide (GIP) receptor, which all stimulate mTORC1, thereby promoting β-cell replication. Insulin and IGFs, in concert with the nutrients leucine, glutamine and glucose, modulate protein translation through mTORC1 in β-cells[57,103]. It has been shown that glucose robustly activates mTORC1 in an amino-acid-dependent manner in rodent and human islets. The mTORC1 inhibitor rapamycin dose-dependently inhibited DNA synthesis of rat islets exposed to elevated levels of glucose. mTORC1/S6K1/4E-BP1-signaling is known to control cell size and proliferation by increasing mRNA translation and cell cycle progression[28,30,105]. A decade ago, leucine had already been demonstrated to activate the translational regulators, phosphorylated heat- and acid-stable protein regulated by insulin and S6K1, in an insulin-independent and rapamycin-sensitive manner through mTORC1. mTORC1 is not only a central regulator of protein biosynthesis but also of lipid biosynthesis by regulation of SREBP1, the key transcription factor of lipid synthesizing enzymes. mTORC1 regulates lipin 1 localization in the nucleus and thereby controls the SREBP pathway. Leucine-induced insulin secretion by β-cells involves increased mitochondrial metabolism by oxidative decarboxylation and allosteric activation of GDH. The same intra-mitochondrial events that generate signals for leucine-induced insulin exocytosis are required to activate the mTORC1 mitogenic signaling pathway by β-cells. These findings indicate that leucine at physiological concentrations stimulates S6K1 phosphorylation via mTORC1, in part, by serving both as a mitochondrial fuel and as an allosteric activator of GDH. It has been concluded that leucine is essential for activation of protein translation through mTORC1 and contributes to enhanced β-cell function by stimulating growth-related protein synthesis and β-cell proliferation[106,107]. These observations fit very well to recent findings showing that mTORC1 activation in β-cells of TSC2 deficient mice (βTSC2-/-) increased mitochondrial biogenesis and enhanced insulin secretion. In contrast, S6K1-deficient mice display hypoinsulinemia, glucose intolerance and diminished β-cell size. Thus, there is substantial evidence for the crucial role of leucine in mTORC1-mediated activation of β-cell protein translation, insulin synthesis and secretion and β-cell proliferation[58,103,106,107]. The Western diet provides ideal conditions for exaggerated mTORC1 activation. This hyperglycemic, insulinotropic and leucine-rich diet offers abundant glucose, insulinotropic dairy proteins with rising amounts of leucine over the last decades by increased meat and dairy protein consumption (Figures 1-3). The simultaneous availability of high levels of glucose, insulin, IGF-1 and leucine especially result in maximal mTORC1 stimulation, leading to increased β-cell proliferation. However, persistently over-stimulated β-cell proliferation holds the risk of early onset of replicative β-cell senescence. The risk for T2D would be low when senescent or functionally impaired β-cells are replaced by stem cell-driven β-cell neogenesis. However, recent studies[110,111] in rodents clearly confirmed that adult β-cells are not replaced by stem cell-driven neogenesis but by self-duplication of differentiated β-cells. This finding is of fundamental biological importance because the rate of cell divisions limits the life and function of a somatic cell by induction of replicative cell senescence according to the Hayflick limit. In fact, both increased β-cell proliferation and β-cell apoptosis are characteristic hallmarks of β-cell mass disturbance in T2D when compared with non-diabetic subjects[101,102]. There is recent experimental evidence for the proposed concept of mTORC1-driven early β-cell senescence and apoptosis in T2D. Mice, specifically deficient in TSC2 in pancreatic β-cells (βTSC2-/- mice), exhibit hyperactivated mTORC1 signaling with increased IGF-1 dependent phosphorylation of S6K1 and 4E-BP1. At young ages (< 28 wk), these mice exhibit hypoglycemia and hyperinsulinemia associated with increased islet cell mass and increased sizes of individual β-cells. After 40 wk of age, however, βTSC2-/- mice develop progressive hyperglycemia and hypoinsulinemia accompanied by a reduction in islet mass due to a decrease in the number of β-cells. This intriguing animal model of T2D strongly supports the concept of early β-cell senescence and apoptosis due to increased activity of mTORC1 in the induction phase of T2D. Furthermore, this model provides an excellent explanation for the relationship between low birth weight and increased risk for T2D in adult life[114,115]. Accelerated or “catch-up” postnatal growth in response to small birth size is thought to presage disease years later. Recent studies in FASDEL (fatty acid synthase heterozygous) mice, a model of intrauterine growth restriction, allowed the conclusion that increased β-cell mass developed in response to decreased body size. FASDEL mice are born small yet have expanded β-cell mass and increased insulin secretion without insulin resistance. However, β-cell hyperfunction in early life resulted in β-cell failure with advanced age. The endoplasmic reticulum (ER) is a cellular organelle responsible for multiple important cellular functions, including the biosynthesis and folding of newly synthesized proteins destined for secretion, such as insulin. The ER participates in all branches of metabolism, linking nutrient sensing to cellular signaling. Leucine-mediated hyperactivation of mTORC1 resulting in excessive protein (insulin, islet amyloid protein) synthesis and exaggerated mTORC1-SREBP-induced lipid synthesis may overload the functional capacity of the ER resulting in ER stress[28,30,87,105,106]. ER stress triggers an adaptive signaling cascade, called the unfolded protein response (UPR), to relieve this stress. The failure of the UPR to resolve ER stress leads to pathological conditions such as β-cell dysfunction and death and T2D. The Western diet with increased glucose-, insulin/IGF-1- and leucine-mediated stimulation of mTORC1 may well explain the pathogenesis of T2D. Increased and continued β-cell proliferation during the first decades of life may thus result in β-cell failure with age. Pro-proliferative signals of the Western diet and especially the persistently increasing levels of leucine may have a crucial impact on the functional capacity of the ER and thus β-cell homeostasis. There are intriguing new insights into the mode of action of the old anti-diabetic drug metformin. Metformin and its more hydrophobic biguanide analogue phenformin inhibit mitochondrial respiratory chain complex I, which reduces ATP production, thus resulting in the activation of AMPK. AMPK inhibits mTORC1 by direct phosphorylation of TSC2 and Raptor[34,46,49,119]. The major action of metformin in T2D is thought to depend on decreased hepatic glucose output and increased intestinal glycolytic lactate production as well as peripheral tissue insulin-dependent glucose uptake[120,121]. Recently, a further mode of metformin-mediated attenuation of mTORC1 signaling was demonstrated which interferes with leucine signaling. Both metformin and phenformin have been shown to inhibit amino acid-dependent Rag GTPase-mediated mTORC1 signaling. Metformin and phenformin interfere with leucine-dependent Rag GTPases required for translocation of inactive mTORC1 to activated Rheb enriched in lysosomal membranes, thereby reducing mTORC1 activity[35-37]. Similar to the effect of amino acid withdrawal, treatment of cells growing in amino acid-rich media in the presence of phenformin caused mTORC1 to leave the perinuclear intracellular compartment and to disperse throughout the cytoplasm without affecting amino acid steady state levels. It is thus imaginable that metformin (C4H11N5; molar mass 129.1) functions as a competitive inhibitor of leucine (C6H13NO2; molar mass 131.2) in the Rag GTPase-dependent process of mTORC1 activation. Notably, the usual daily dose of metformin (2 g/d) is in the range of 2 g leucine derived from daily consumption of 100 g meat or cheese. Moreover, inhibition of mTORC1-mediated growth signaling by metformin explains metformin’s cancer-reducing activity[123-127]. mTORC1 activation by leucine-rich animal food may be attenuated by natural plant-derived inhibitors of the mTORC1 signaling pathway. Increasing studies have demonstrated that resveratrol, epigallocatechin gallate (EGCG), genistein, 3,3’-diindolylmethane (DIM), curcumin and caffeine may all inhibit mTORC1 signaling directly or indirectly[128-143]. Resveratrol, a polyphenolic flavonoid from grapes and red wine, exerts potential anti-diabetic properties by downregulation of PI3K/Akt/mTORC1 signaling[128,129]. Resveratrol inhibits PI3K by targeting the PI3K ATP-binding site in a competitive and reversible fashion. Resveratrol has been proposed to have beneficial effects in the treatment and prevention of T2D[144,145], obesity[144,146-148] and metabolic syndrome. EGCG, the specific green tea catechin, has been proven to function as an ATP-competitive inhibitor of both PI3K and mTORC1. The anti-obesity effects of green tea catechins are supposed to be mediated by EGCG-induced inhibition of the PI3K/Akt/mTORC1 signaling[134,150]. Curcumin, a natural polyphenol product isolated from the rhizome of the plant Curcuma longa, exerts anti-proliferative effects and may present another class of mTORC1 inhibitors. Curcumin inhibited mTORC1-mediated signaling pathways in cancer cells and inhibited phosphorylation of mTORC1 and its downstream targets, S6K1 and 4E-BP1[141-143,151]. Most recently, it has been demonstrated that curcumin dissociated Raptor from mTORC1, thereby inhibiting mTORC1. DIM is generated in the acidic environment of the stomach following dimerization of indole-3-carbinol monomers present in cruciferous vegetables such as broccoli, brussel sprouts, cauliflower and cabbage. DIM suppresses signaling through Akt/mTORC1 pathways resulting in cell cycle arrest. DIM significantly inhibited both Akt and mTORC1 in PC3 PDGF-D cells. Genistein, the soy-derived isoflavone and phytoestrogen, inhibited PI3K/Akt/mTORC1 signaling in cancer cells. Genistein is a natural protein tyrosine kinase inhibitor, induces G2/M arrest and apoptosis and inhibits PI3K/Akt-cascades, resulting in downstream inhibition of mTORC1[154,155]. Caffeine, the most commonly consumed neurostimulatory compound by humans, exhibits diabetes-preventive effects. Caffeine has been reported to inhibit PI3K kinase, including mTORC1, and decreases the phosphorylation of S6K, S6 ribosomal protein, and 4E-BP1[157,158]. Caffeine-induced autophagy mainly depends on the PI3K/Akt/mTORC1 pathway. Taken together, the therapeutic and anti-diabetic effects of natural plant-derived mTORC1 inhibitors appear to counterbalance up-regulated mTORC1 signaling promoted by the Western diet rich in glucose, fat, insulinotropic and leucine-enriched animal and dairy proteins. T2D is closely associated with an increased risk of other age-related diseases like obesity, cancer and neurodegenerative diseases. Activated mTORC1 signaling has already been implicated to play important roles in the development of Western diseases, especially insulin resistance, T2D, obesity, cancer and neurodegenerative diseases[29,160-163]. Intriguingly, inhibition of mTORC1 by rapamycin abolished cognitive deficits and reduced amyloid-β levels in a mouse model of Alzheimer’s disease. A lower risk of Alzheimer’s disease was characterized by higher intakes of salad, nuts, fish, tomatoes, poultry, cruciferous vegetables, fruits and dark and green leafy vegetables and a lower intake of high-fat dairy products, red meat, organ meat and butter. Furthermore, the leucine-antagonizing mTORC1 inhibitor metformin has been shown to exert cancer-protective effects[123-128]. It is not surprising that natural plant-derived mTORC1 inhibitors like resveratrol and EGCG exhibit beneficial effects, not only in treatment and prevention of T2D, but also in obesity, cancer and neurodegenerative diseases, which all have hyper-activated mTORC1 signaling in common. The Western diet up-regulates all three major pathways important for mTORC1 activation (Figure 4): (1) increased supply of glucose, fat, alcohol (energy); (2) increased food-mediated insulin/IGF-signaling; and (3) abundance of leucine which is supplied by meat and dairy proteins consumed in increasing amounts during the last decades (Figure 3). High levels of glucose and fat increase cellular energy (ATP) levels and thus suppress AMPK activity resulting in mTORC1 activation. Furthermore, high glycemic load with high glucose availability stimulates insulin signaling, which has been a matter of concern for more than a decade. Most important growth factor signals for activating mTORC1 are insulin and IGF-1. Plasma IGF-1 concentrations depend on the level of dietary protein intake, with low protein diets being associated with reduced circulatory IGF-1 levels. The liver is the major site secreting IGF-1 into the systemic circulation. Remarkably, hepatic IGF-1 production has been shown to be dependent on the availability of amino acids. IGF-1 is a crucial growth factor signal for mTORC1 activation in pancreatic β-cells. Persistent reduction of pancreatic β-cell mass has been demonstrated in young rats after a limited period of protein-energy malnutrition. The high meat consumption of the Western diet, which has more than doubled in Germany between 1950 and 1975 and maintained its high value until today (Figure 1), supplies plenty of amino acids for high hepatic IGF-1 synthesis as well as high amounts of leucine for mTORC1 activation. However, the highest source of leucine is provided by milk proteins. In fact, mammalian milk is the physiological diet to mediate postnatal growth. It is thus conceivable that milk proteins significantly contribute to profound mTORC1 activation to ensure adequate β-cell growth as well as increased secretion of the anabolic hormone insulin. Milk has to be regarded as an endocrine signaling system that up-regulates mTORC1 activity by increasing insulin secretion, hepatic IGF-1 secretion and mTORC1-mediated β-cell growth and proliferation for neonatal growth requirements. Milk consumption not only stimulates the somatotropic axis but also activates incretin signaling by enteral stimulation of GIP[27,170]. Cow milk’s excessive insulinotropic activity is characterized by milk’s high insulinemic index. Notably, increased daily intake of milk but not meat significantly raised basal insulin and IGF-1 serum levels and increased insulin resistance in 8 years old boys. 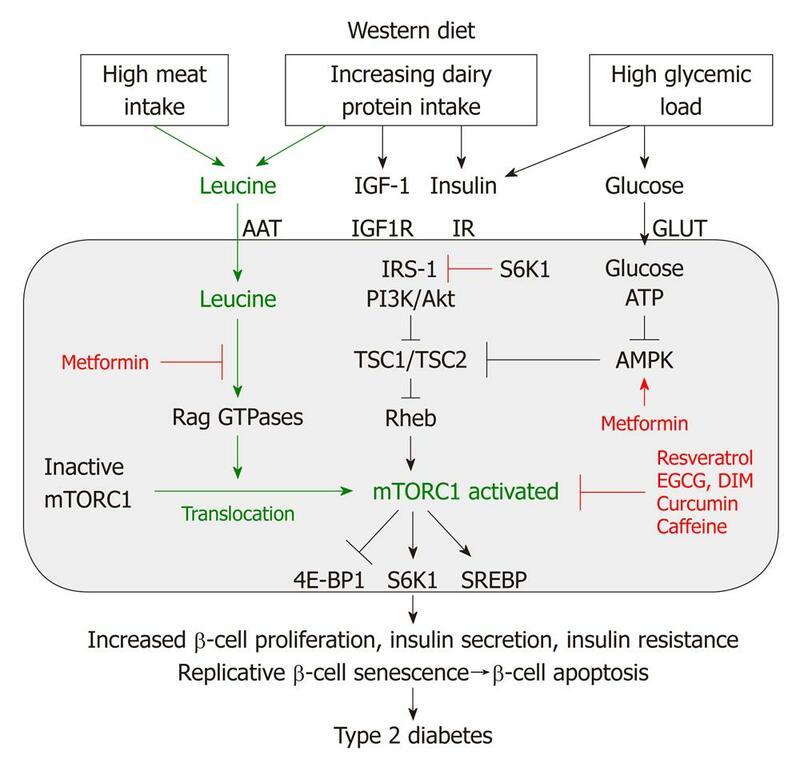 Milk-induced insulin resistance can be well explained by increased mTORC1/S6K1-mediated IRS-1 phosphorylation. Moreover, epidemiological data in adults confirmed the correlation between increased dairy protein consumption and raised IGF-1 serum levels[173,174]. Thus, dairy protein consumption significantly contributes to exaggerated insulin/IGF-1-signaling and insulin resistance promoted by the Western diet, appreciated risk factors involved in the development of T2D and obesity. Remarkably, patients with Laron syndrome due to congenital IGF-1 deficiency exhibit short stature and lower incidence rates of acne, T2D and cancer, which may be explained by reduced mTORC1 stimulation due to low insulin/IGF-1 signaling. Whey proteins have to be regarded as life starter proteins that contain the highest amount of leucine (14%), followed by casein (10%), the major protein constituent of cow milk and cheese (Table 2). For comparison, 100 g of rump steak contains approximately 2.4 g leucine comparable to 100 g of Gouda cheese (2.4 g), which is in strong contrast to 100 g white cabbage (0.056 g), or 100 g apple (0.016 g) (Tables 2 and 3). To reach the leucine intake provided by 100 g Gouda cheese or 100 g steak, 4.2 kg white cabbage or 100 apples could be consumed. These calculations exemplify the extreme differences in leucine amounts provided by an animal meat/dairy protein-based diet in comparison to a vegetarian or vegan diet. Thus, the increased consumption of meat and dairy proteins provide excessive amounts of leucine for mTORC1 activation. In comparison to meat, milk proteins are unique as they provide two major activating signals for mTORC1 activation, i.e., high insulin/IGF-1 signals as well as high leucine availability (Table 4). The average protein content of human milk during the first 12 mo of lactation has been determined as 1.2 g protein/100 mL of whole milk. This is the lowest protein concentration found in the milk of any mammalian species in which this value has been measured. In comparison, cow milk contains 3.4 g protein/100 mL. It has been shown that the protein content of mammalian milk of various species is inversely related to the rate of growth of the offspring. Human neonates receive the lowest protein content of milk among mammalian species and require 180 d to double their birth weight in comparison to rat or rabbit with milk protein concentrations of 9 and 10 g/100 mL, respectively, which already double their birth weight after 5 d. It is known that premature infants fed formula containing a higher protein concentration gain weight faster than those fed formulas with a protein concentration closer to that of human milk[178,179]. Remarkably, the leucine amount per g milk protein appears to be a mammalian species-independent constant in the range of 100 mg leucine/g milk protein for man, various primates and non-primate species, including cow. Thus, the total amount of milk protein fed to infants is the critical determinant for the total leucine uptake, an important signal for mTORC1 activation. It is thus of most serious concern that currently available cow milk-based infant formula, especially “hypoallergenic” whey-based products, provide more than double the amounts of leucine/feeding volume in comparison to the physiological leucine content of human breast milk. Thus, artificial cow-milk-derived infant formula does not meet the physiological lower leucine signaling axis required for adequate mTORC1 regulation in the human newborn. These postnatal aberrations of leucine-mediated mTORC1 signaling explain the early protein hypothesis, which links high protein intake during the neonatal period to increased weight gain and childhood obesity. In fact, a higher protein content of infant formula has been associated with a higher weight in 2 years old infants[181,182]. The markedly higher protein and leucine intake with infant formula feeding, as compared with the protein supply in breastfed babies, may play the most important role in predisposing infants to an increased risk for obesity and T2D in later life[181,182]. It has been recently confirmed that BCAAs, total IGF-1 as well as C-peptide, were significantly higher in infants fed a high-protein formula (2.9 and 4.4 g protein/100 kcal) in comparison to infants fed a low-protein formula (1.77 and 2.2 g protein/100 kcal) compared to breastfed infants. Median serum concentrations of leucine at 6 mo of age were lowest in breast-fed infants (106 μmol/L) compared to infants either fed low-protein formula (120 μmol/L) or high protein formula (165 μmol/L). Moreover, this study showed a correlation between total serum IGF-1 and growth (weight-for-length) at 6 mo of age. Furthermore, strong evidence for cow milk-induced linear growth comes from observational and intervention studies in developing countries and many observational studies from well-nourished populations. In an effort to match the protein quality of human milk, cow-milk based infant formula currently contains almost 50% higher protein content (2.1-2.2 g/100 kcal) than human milk. The appropriate supply of protein and amino acids and especially leucine appears to be a most critical factor in the postnatal period, a phase of metabolic programming. Early postnatal underfeeding and overfeeding of mice resulted in adult metabolic abnormalities. In adult life, underfed mice, which were restricted to mouse milk in the early postnatal period exhibited impaired insulin secretion, whereas overfed mice, which received more milk protein and total leucine during the early postnatal period developed insulin resistance later in adult life. Taken together, these data clearly allow the conclusion that increased dairy protein consumption during the neonatal period raised serum leucine and IGF-1 levels, which will have an impact on postnatal mTORC1 signaling. Milk signaling via insulin, IGF-1, GIP and leucine promotes general growth, β-cell growth, β-cell proliferation, increased insulin secretion, as well as S6K1-mediated early events in mesenchymal stem cell commitment increasing the number of adipocytes, thus programming critical early steps in adipogenesis[84-86]. The increased risk for obesity in leucine-rich formula fed infants and the obesity-protective effects of physiological breastfeeding associated with lower leucine supply to the infant, may just reflect differences in leucine-stimulated mTORC1 activity, which when persistently over-activated promotes the pathogenesis of obesity, insulin resistance and T2D. Accumulating evidence supports the role of increased leucine-driven mTORC1 signaling in the pathogenesis of T2D. Amino acids, especially leucine, significantly stimulate mTORC1 activity. Besides high fat and high glucose, critical attention has to be paid to the daily intake of animal proteins, especially leucine-rich meat and dairy proteins. The anti-diabetic and cancer protective effects of metformin may be related to metformin’s antagonistic effect on leucine-mediated mTORC1 activation. Diabetes-preventive effects of plant-derived polyphenols and flavonoids may depend on their ability to attenuate mTORC1 signaling. Moreover, the therapeutic effects of bariatric surgery in obesity and T2D may be causally related to reduction of BCAA levels and mitigated leucine-driven mTORC1 activation. The excessive consumption of cheese, a protein preparation conserving the potent endocrine signaling system of Bos taurus, increased sixfold in Germany and other countries consuming a Western diet. Predominantly high meat and dairy intakes have additive effects on the net increase of leucine uptake per capita, which is still rising. Excessive leucine signaling towards mTORC1 may thus be the overlooked environmental risk factor promoting increased β-cell proliferation and insulin secretion, leading to accelerated early β-cell senescence and apoptosis, which finally results in secretory deficiency of β-cells. Unfortunately, in Westernized countries, exaggerated leucine-mediated stimulation of β-cell mTORC1 starts during pregnancy by high leucine-intake of the pregnant woman and continues at the beginning of postnatal life when infants are fed cow milk-based infant formula, providing excessive amounts of leucine compared to human breast milk. The presented leucine/mTORC1-concept of T2D is in accordance with recent epidemiological and biochemical data and needs to be validated by leucine-restricted placebo-controlled intervention studies. Future dietary strategies have to consider an adequate balance of average daily leucine uptake to meet signaling requirements for optimized conditions of pancreatic β-cell homeostasis. Infant formula should not exceed the physiological daily amounts of leucine provided by human breast milk. In general, lower leucine levels are only reached by restriction of animal proteins. Current recommendations to further increase the daily protein intake “to provide some benefit in managing chronic diseases” such as obesity and T2D have to be challenged with respect to their potential long-term adverse effects of exaggerated mTORC1 signaling. The functional role of leucine in regulating mTORC1 activity clearly favors a reduction of total protein intake to levels between 8% and 12%, as suggested by T. Colin Campbell (Cornell University) in the ongoing protein debate. However, the question “How much protein is needed?” will not satisfactorily characterize the effects of protein-mediated signaling. More importantly, we have to consider “How much leucine intake is appropriate to maintain long-term mTORC1-regulated β-cell homeostasis?” An adequate regulation of leucine uptake by limiting the amount of animal protein/leucine intake and the implementation of more plant and fruit consumption, as accomplished by traditional Chinese diet, will provide a rational and most powerful tool for the prevention of T2D, obesity and other mTORC1-driven diseases of civilization like cancer and neurodegenerative diseases.